I would like some help with identification of this lower plant. Can anyone help me? I'd love to say, "Welcome to The Helpful Gardner, glenda98; your plant is a(an) ____." Unfortunately, all I can say is, "Welcome to The Helpful Gardener"! Although your healthy and robust plant looks familiar, I can't be sure of what it is *and* I can't even remember the name of the plant I've seen many times.... Check in again in a few hours; someone is bound to know what it is. Happy gardening, and I wish you success very soon on the plant ID! Hello Glenda! 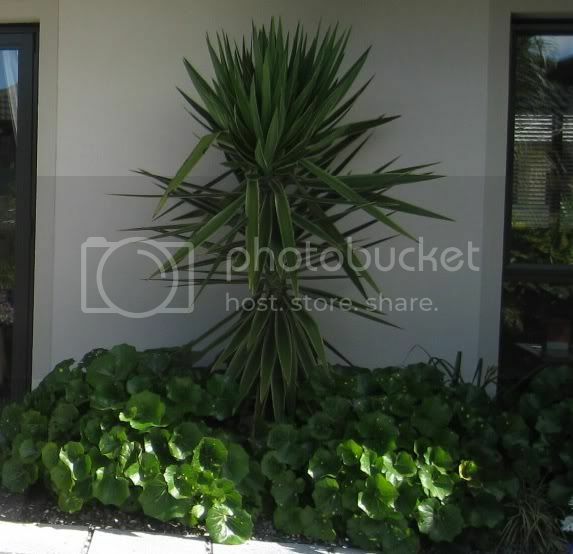 I'm gonna take a stab and say that's Yucca aloifolia or Yucca marginata. Last edited by HortIQ on Wed Dec 08, 2010 9:44 pm, edited 1 time in total. A warm welcome to you, Glenda! Thanks very much for your help. I think Kisal has answered my question which I am very grateful for. It was the spots that were my clue ... One of the common names for it is Spotted Leopard Plant. Oh THAT plant ....Kisal I read your post and I'm thinking my old eyes are really failing me now I can see no spots . And I got your MSG Glenda....I tried.